When I checked my work email yesterday, I got this message from Odesk. 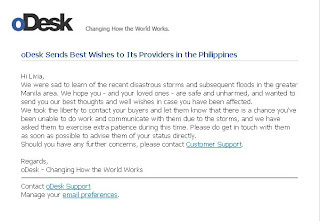 Odesk is sending their best wishes to all providers in the Philippines when they have learned of the recent disastrous storm and subsequent flood that happened last weekend. They sent emails to all buyers of Filipino providers informing them of what had happened and that their providers might be affected by the storm, and be patient if their providers have not done some work lately. Odesk is after all a human being, not just a technology or a site that gives work to outsourcing providers. Its great to know that Odesk gives importance to their providers. Through their email, I have received several messages from my current and past buyers, wishing that me and my family are doing ok. It was great to receive those messages even though we are one of those lucky enough not affected. I am in Manila but I didn't even lost my internet connection. I know there are a lot of Filipino providers who have been affected, I wish them well, and I know that soon they will be able to go back to work and resume their lives, as said, "there is always a rainbow after the storm". Odesk is really great and I am happy to have been part of Odesk for the past one year and 6 months, and I will continue on working through your system. yup the simple message was very heart warming.